It is so exciting to be reviewing Naomi Nachman’s second book. Her first book Perfect for Pesach is full of wonderful, easy to prepare recipes that are Perfect for Pesach and all year round. As Naomi expresses so well at the beginning of her radio show, Table for Two, on the Nachum Segal Network; and I paraphrase: “I love food. I love to look at food, I love to shop for food, I love to create food, serve food, eat food- I’m all about food!” That effervescent philosophy is made clear again in Naomi’s new book. She has taken the inspiration she absorbed from her grandmother in Australia, and translated it into traveling the world to learn about many other cultures and their cuisine. Naomi has found the many areas where cultures are alike; for instance, she points out that many different cultures use similar dough pockets to hold fillings and sauces. But she also notes the effect that local spices and vegetables can have on a region’s cuisine. The recipe for Harissa Carrots (pictured at top) is as beautiful as it is easy to prepare. You can just roast the carrots as described in the first half of the recipe or go for the special treat of making the simple Harissa dressing to pour over them. They are truly delicious and can be served at room temperature. I also made the Vietnamese Spring Rolls with Peanut Sauce. I can’t share the recipes with you here – you’ll just have to buy the book and make them to see for yourself how wonderful they are. I made a lot of them and they were gobbled up in a flash! Chanukah is coming. 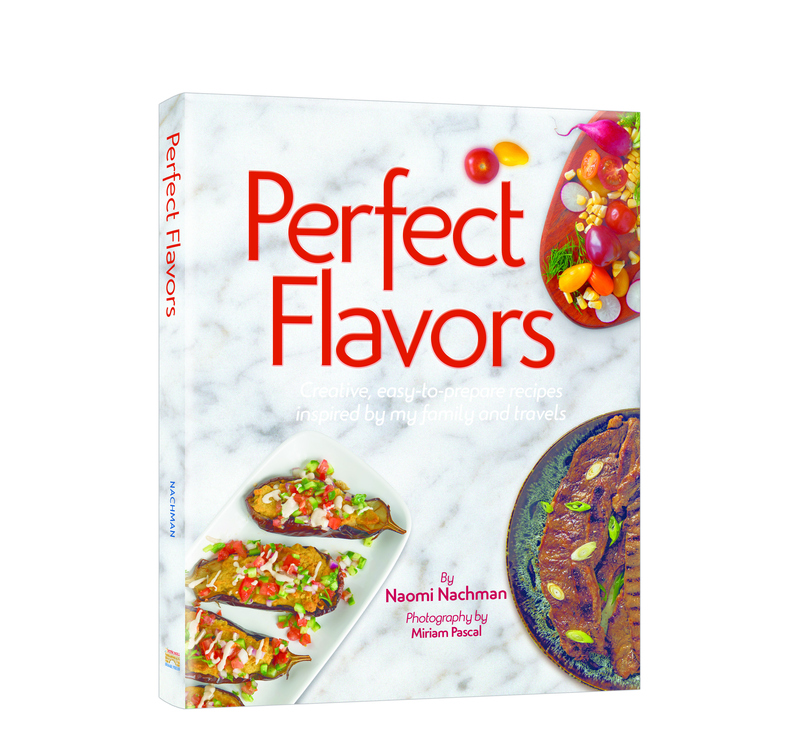 Perfect Flavors would be a perfect gift for all the teenagers through grownups on your list. The photos, brilliantly shot by Miriam Pascal, make every recipe come to life. Often, it is easier to make a new recipe if you have an idea of what it’s supposed to look like. Yours doesn’t have to look exactly the same; but here you have a helpful guide! Between Naomi Nachman’s clearly written recipes and Miriam Pascal’s accompanying photos, it’s almost like they’re holding your hand while you cook. Buy this book. You’ll definitely add many new recipes to your repertoire.